Today I’m going to share an AMAZING Coconut Filling that we used in our Almond Joy Cake. 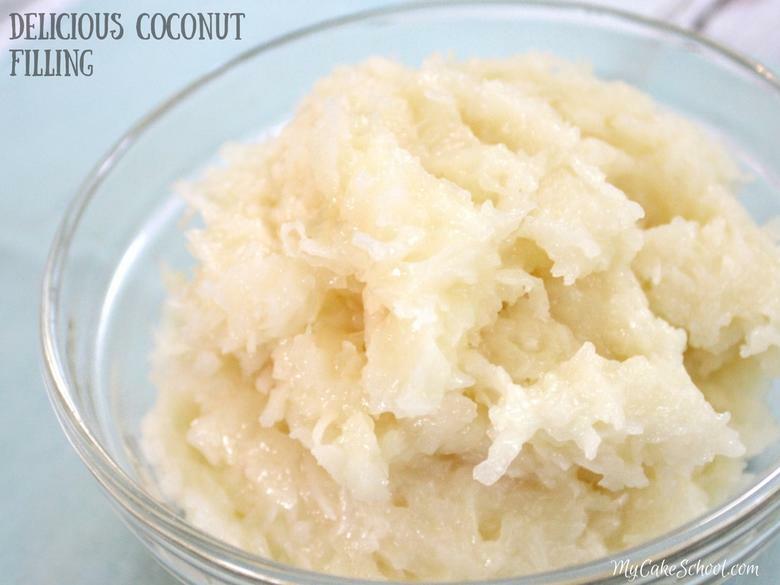 If you love coconut, drop everything and print off a copy of this deliciousness! We experimented with several different recipes in our search for the perfect coconut filling for our Almond Joy Cake. This thick coconut filling has such a wonderful flavor and consistency that we knew we had a winner as soon as we tried it! There is a surprise ingredient in this recipe: marshmallows! The marshmallow flavor is not noticeable, only the delicious coconut. However, adding melted marshmallows to this recipe was the key to getting the consistency that we were looking for…much like the coconut filling of an Almond Joy or Mounds candy bar. In a saucepan over medium heat add the milk and sugar. Stir until the sugar is dissolved. It is a slow process because you don't want the milk to boil. Once the sugar has dissolved, add the marshmallows. Stir constantly, when the marshmallows begin to soften, remove from the heat and whisk until the marshmallows have melted. Stir in the coconut and coconut extract. Allow to cool completely before spreading between the layers. It will thicken as it cools. It can be made in advance and refrigerated. For our Almond Joy Cake, we filled our three layer cake with this filling and also spread some on top then sprinkled a bit of coconut on it. In a saucepan over medium heat add the milk and sugar, stir until the sugar dissolves. It is a slow process because you don’t want the milk to boil. Once the sugar has dissolved, add the marshmallows. Stir constantly, when the marshmallows begin to soften, remove from the heat and whisk until the marshmallows have melted. 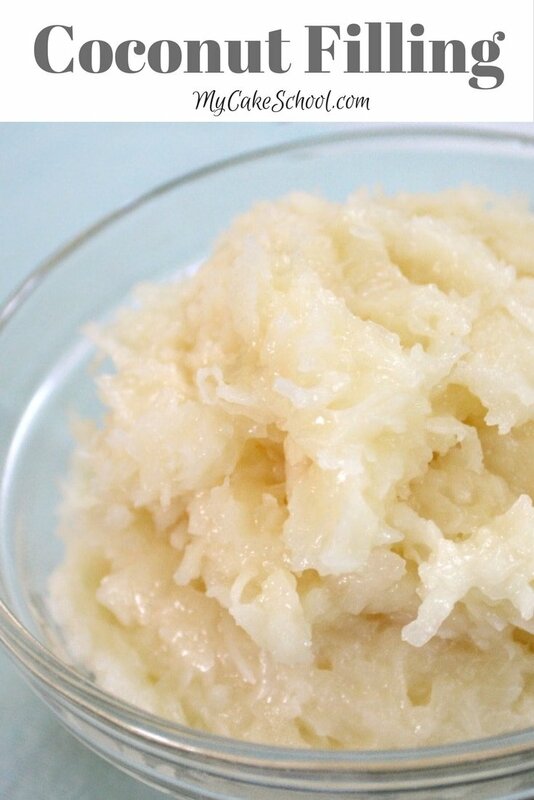 Stir in the coconut and coconut extract. Allow to cool completely before spreading between the layers. It can be made in advance and refrigerated. « A Roundup of the BEST Cakes and Sweets for July 4th! I made this filling for my Mom’s Birthday Cake. I weighed and measured all ingredients and followed all instructions.. It turned out very liquid, I let it sit overnight in the fridge and by morning it was thick. But as it came to room temperature it was a bit liquid. I substituted Almond extract for the coconut extract. The taste was wonderful – Mom loved it. I will definitely make it again but I will add less milk and more marshmallows. It made the cake very moist. A bit less liquid would be perfect. Hi MsGF, I have been thinking about this recipe. I made the coconut filling in advance and refrigerated. The next day the cake was filled, frosted with ganache and more coconut filling on top. The coconut filling was probably not completely at room temperature before spreading. We cut a few pieces for ourselves, refrigerated the cake and soon afterward gave the cake to a neighborhood friend. So I may not have seen it at completely room temperature. I am going to make the filling again today and get back to you. Thanks BeBe – it is a wonderful filling, we enjoyed it. I will make it again for sure – just with less milk – I would start with 1/2 up to 3/4 cup max and more marshmallows. I look forward to your experimenting results :-) Try it with Almond Extract – yummy! I couldn’t remember the full details of how the filling looked or if I let it come completely to room temperature, so I made it again last night. My filling was not liquid at all, it was quite thick when completed. I refrigerated the filling overnight and it has come to room temperature today and is still very thick. I am sorry yours was too liquid, hope that won’t happen again. Hi Tammy, You would need to refrigerate a cake that has this filling. I made this feeling for my mother’s 80th birthday because coconut is her absolute favorite. I measured all of the ingredients and cooked it exactly as described and it turned out perfect. It was a big hit thank you so much for this recipe and keep them coming! hi can I use fresh coconut??? Hi Carol, We have never used fresh coconut so I am not sure if you will like the outcome. I think it will not be as sweet as using shredded sweetened coconut. I use sweetened coconut as well as adding an additional 1/2 cup sugar. Can this filling be used to make chocolate bon bons? Hi Margot, We have not tried the filling for bon bons, but I think it should work for you. The bon bons would need refrigeration.